This was a 3-for1 campground right off OR 138. It has two nice hiking trails and a lake to kayak. Birdie and I both had level pull-throughs for $5/night with our Parks Pass. 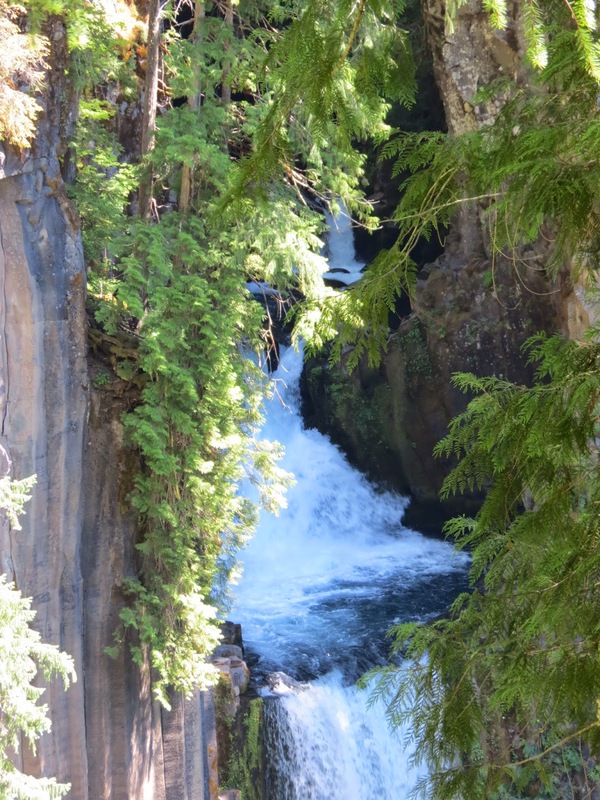 After we got set up, we set off to hike the trail to Toketee Falls. Running next to the parking lot is this enormous wooden pipeline, with water spurting out here and there. A sign explained about the pipeline being part of a hydroelectric project dating from 1949. It's almost as old as me. The wood is redwood. Water spurting from the pipeline. Map of the falls trail. 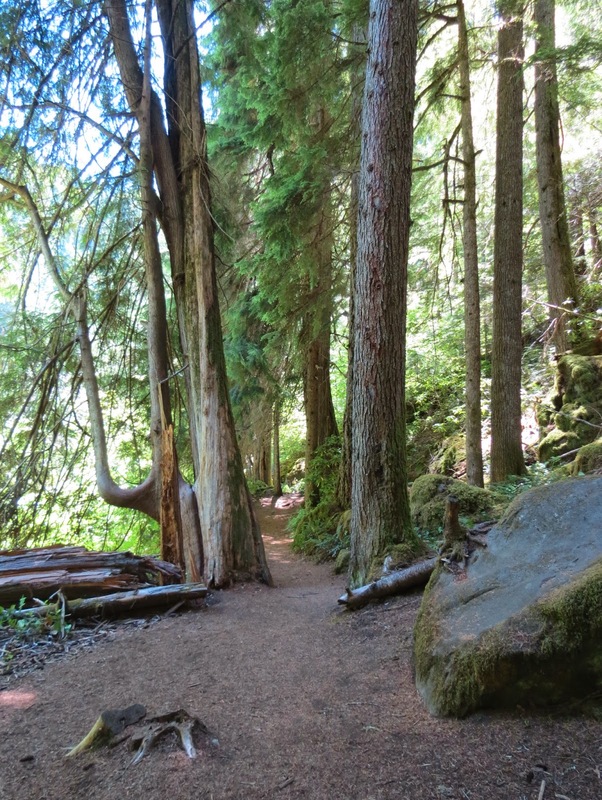 The trail follows the North Umpqua River through a shady old-growth forest. The base of a hollow tree snag. Next to a down cedar tree. 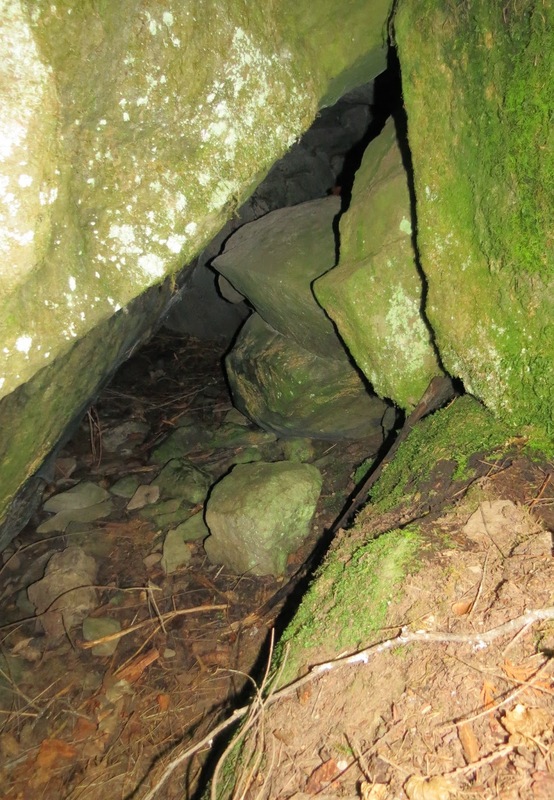 We felt chilly air flowing out of this crevice...there must be a deeper cave in there somewhere, because it's hot and humid along the trail today. 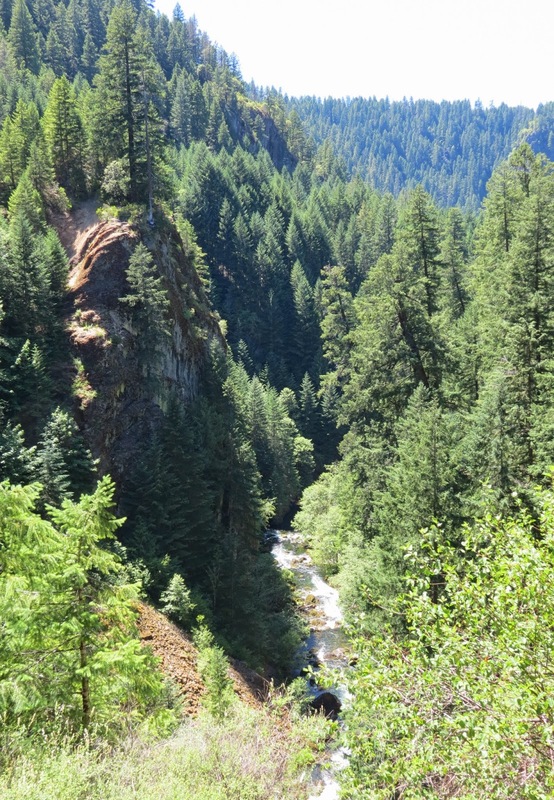 The North Umpqua River above the falls. 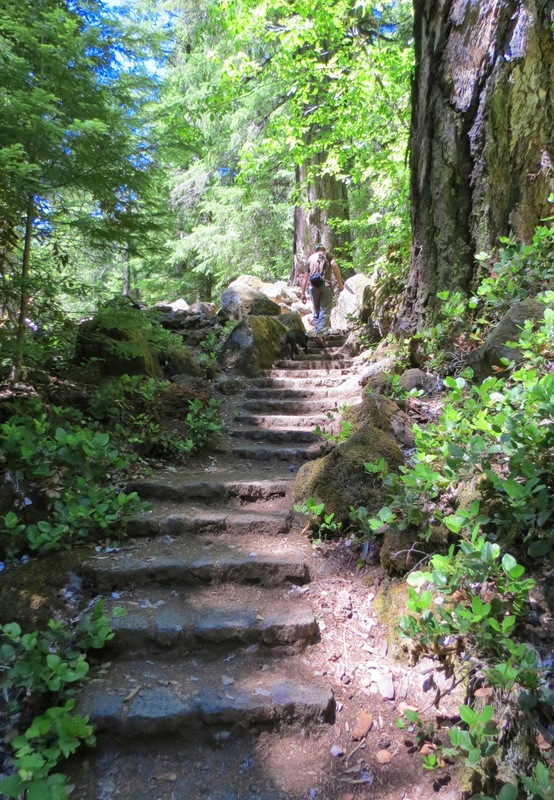 There are several sets of stairs to climb and some to go down. Where the river starts to funnel into the gorge to the falls. 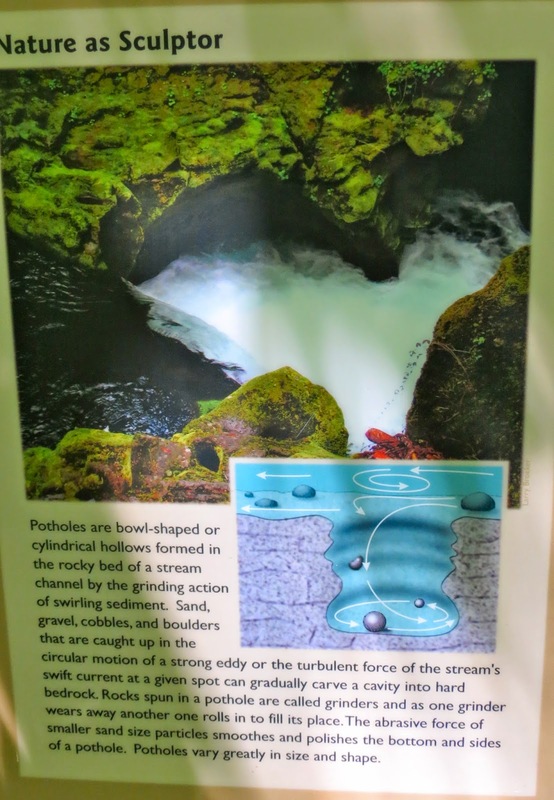 As it starts to plunge it makes whirlpools that have formed these "potholes." From there we have to descend several sets of stairs to view the falls from the the other side. We pass a fern garden on a huge boulder. Up some more stone steps. A view of the gorge beyond the falls. Descending to the viewing platform. 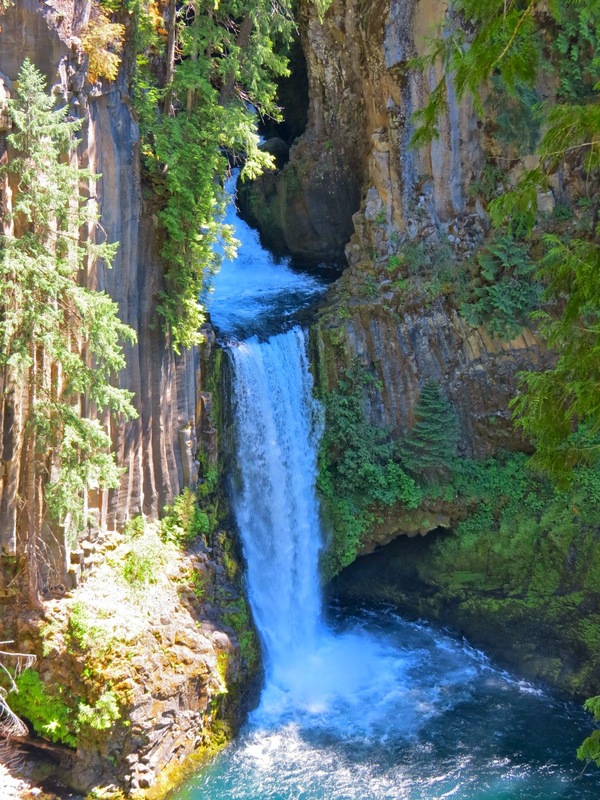 Our first glimpse of Toketee Falls, which plunges 113 feet in two stages. It is hard to see the 28-foot upper tier which flows into a pool flanked by a deep alcove. The main and more attractive section plunges 85 feet into a gorgeous rock-lined blue pool. The columnar basalt you see on either side of the falls is the result of a lava flow from Mount Bailey, a volcano we saw when at Diamond Lake. 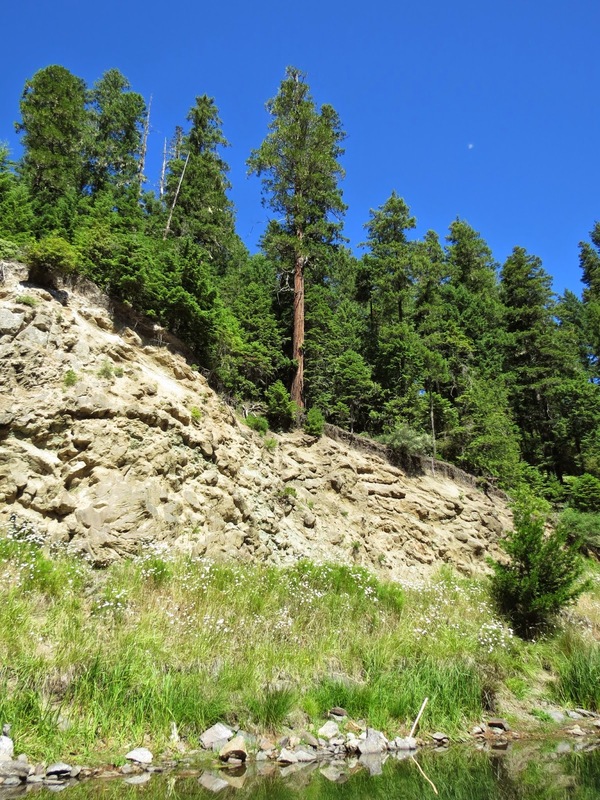 The Mount Bailey eruption that formed these basalt columns occurred between 25,000 and 125,00 years ago. 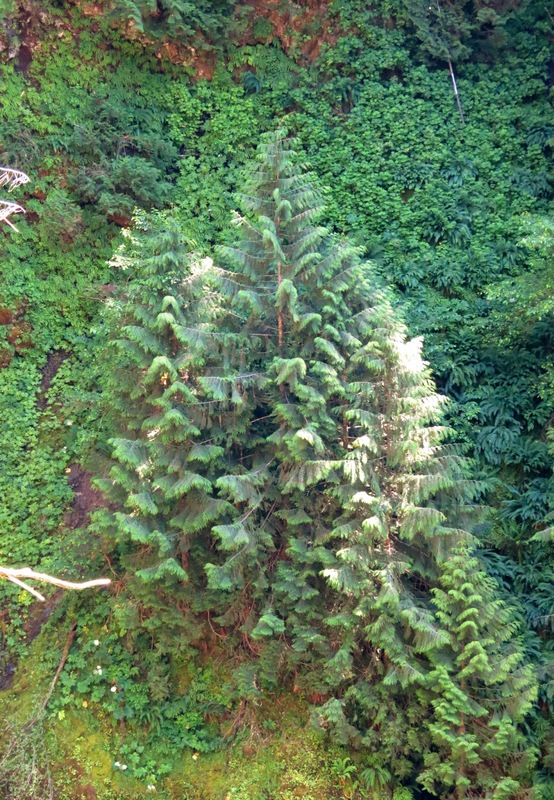 Fir tree growing on the side of the gorge. I don't know what these pink flowers growing on the rocks are called. 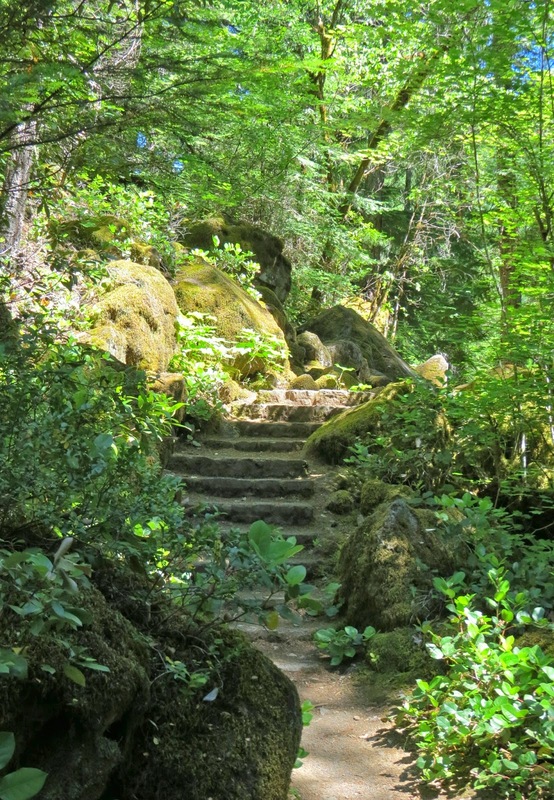 The stone stairways make me think of a Thomas Kincade painting. Made it back up all those stairs! On the way back we stopped to check out the dam. This is the intake point for water flowing into the pipeline. It diverts water from the river to a powerhouse downstream. The dam also creates a reservoir where we kayaked the next day. We also stopped to check out the boat ramp where we will put the kayaks in...hmmm. From the end of the boat ramp we saw 3 otters. Unfortunately this is the only glimpse we got...they weren't there when we put the kayaks in the next morning. There were weeds growing in the area around the ramp, but we were able to negotiate through them to the lake. In the morning Thistle and I took a walk along this trail a short ways. 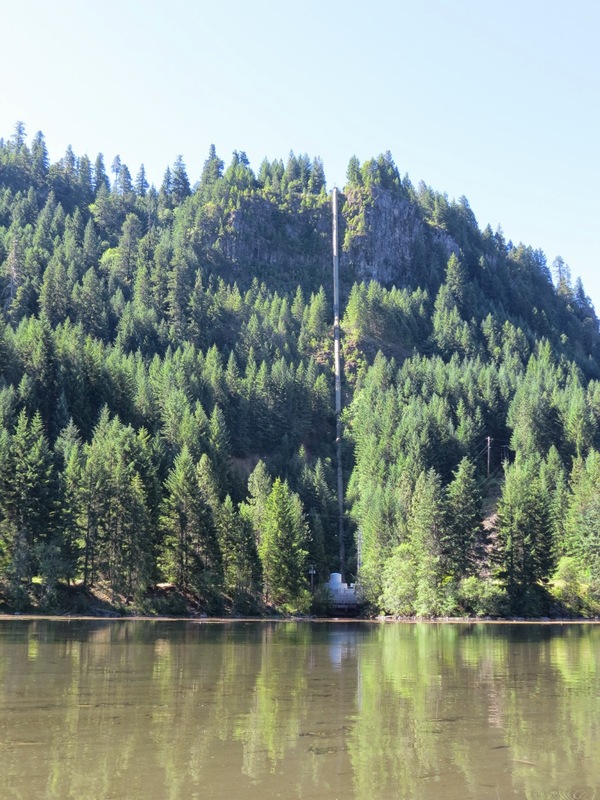 Bridge over the North Umpqua River above the dam and reservoir. I was lucky to catch a shot of an American Dipper! They usually don't hold still long enough. This one was busy taking a bath. North Umpqua River where it flows into the reservoir. 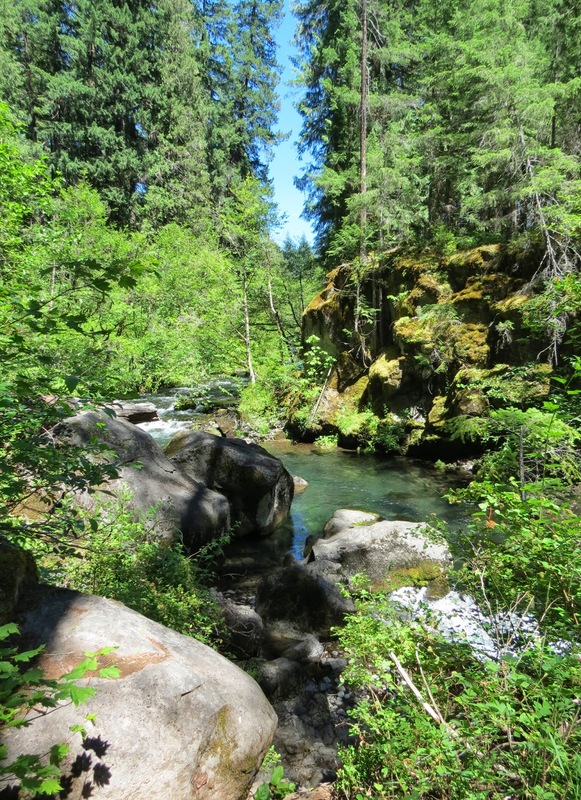 The river flows 111 miles from the Cascades to the Pacific Ocean. Paddling through the weeds to the lake. A resting spot on the other side of the lake. On the way back we saw a surprise visitor resting. The pipeline built up the side of the cliff. It was a good day for reflections. So I reflect on how much God loves me to allow me to see his beautiful creations in so many places. And I reflect on how short and fleeting our time is on this earth to let anything or anyone separate us from His love. The stump of a large cedar tree from a time before the reservoir was made. When we go to be with God, what will we be remembered for here on Earth? Did we convict and judge others, or did we love and forgive? We're near the end of the lake and the dam. There is a viewing platform along the road. Someone lives or has a camp on the other side of the lake. Just turn around and look at all the beauty that surrounds you. "I have learned, in whatsoever state I am, therein to be content." Tomorrow we are off to Canyonville and a get-together with other women RVers. From there, I will start my trek across the country to be with my sister and brother-in-law in Massachusetts. Another beautiful paddle with fantastic scenery and lots of good words to think about.